I first heard of Yotam Ottolenghi in 2012. It was the beginning of Facebook groups as we know them today, and the ladies in the very Jewish group “What’s for dinner?” were starting to go crazy for this new cookbook called Jerusalem . It was a veritable bible of Israeli and Mediterranean flavors, and we were all intrigued and excited. It was also the start of what has become one of the biggest collective and perhaps unintentional PR campaigns for Israeli food around the globe, led by celebrity chefs who serve as Israel’s food ambassadors. This was the start of shakshuka being cool to those outside of this small country. Not to say that the Jerusalem-born Ottolenghi started his career only in 2012. There are four Ottolenghi Delis spread throughout London; his more upscale restaurant, NOPI; and a food and travel television series. In the cookbook department, there was the popular Plenty and Ottolenghi: The Cookbook before Jerusalem, and Plenty More and NOPI: The Cookbook after. Through all this work, Ottolenghi has become best known for his savory cooking—but did you know that he began his career as a pastry chef? 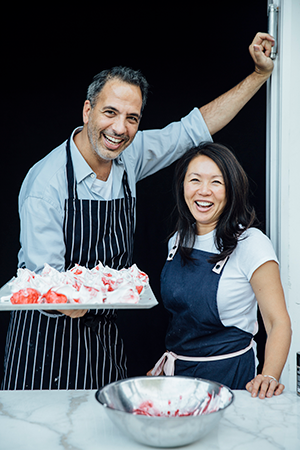 With the arrival of his newest cookbook Sweet: Desserts from London’s Ottolenghi , co-authored with close colleague and accomplished pastry chef Helen Goh, Ottolenghi has come full circle. This book spotlights the scrumptious smorgasbord of desserts found daily in his restaurants. The London transplant draws his dessert inspiration from myriad cuisines: the Middle Eastern flavors Ottolenghi is famous for paired with a special emphasis on Jerusalem; the Australian and Asian flavors Goh grew up with; and classic British desserts as well as the influences of his restaurant staff. Recipes such as Fig and Pistachio Frangipane Tartlets and Pineapple and Star Anise Chiffon Cake showcase these overlapping flavor profiles, and some, such as the Victoria Sponge with Strawberries, stand alone as single-source classics. Case in point, this cookie recipe that is sinfully rich yet delicate—and that would be perfect served after Israeli-inspired mezze salads and spreads. 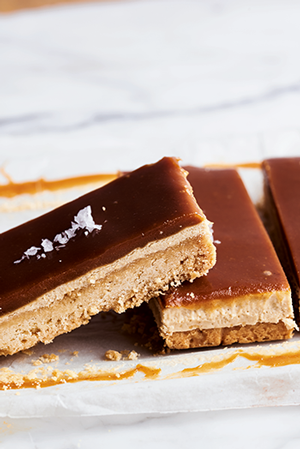 A three-layered bar with a shortbread bottom, halva middle, and glossy tahini caramel top—this was a winning combination just waiting to happen. And happen it did, thanks to Paulina Bembel, our head pastry chef. Paulina, who comes from Poland, skillfully uses our Middle Eastern favorites—tahini and halva—to transform the famously cloying millionaire’s shortbread into something so much better, with a slight bitterness and a touch of salt to offset all that sweetness. Preheat the oven to 400°. Line an 8-inch square pan with parchment paper, making sure that the paper rises up over the edges of the pan. To make the shortbread, sift the confectioners’ sugar and cornstarch into the bowl of an electric mixer with the paddle attachment in place, then add the granulated sugar and mix on medium speed. With the machine still running, slowly pour in the melted butter and beat until combined. Add the vanilla extract and turn the speed to low, then sift in the flour and salt and continue to beat until the dough comes together. Tip the mixture into the pan and use your hands to pat and even out the surface. Bake for 25 minutes, or until golden brown. Remove from the oven and set aside until completely cool; this will take an hour or so, so don’t start making the caramel too soon or it will have set by the time the shortbread is cool. To make the halva, place the halva and tahini in a small bowl and mix with a wooden spoon to combine. Spread the mix over the cooled shortbread and use the back of a spoon to smooth it into an even layer. To make the tahini caramel, combine the sugar and water in a small saucepan and place over medium-low heat. Stir occasionally, until the sugar has dissolved, then increase the heat to medium-high. Bring to a boil and cook—still at a boil—for about 12 minutes, until the sugar is a deep golden brown. Remove from the heat and add the butter and cream; take care here, as the mixture will splutter. Whisk to combine and, once the butter has melted, add the tahini and salt. Whisk to combine again, then pour evenly over the halva layer in the pan, so that all of the halva is covered. Place in the fridge for 4 hours until set, before cutting into 16 bars, about 1 x 4 inches. Sprinkle a pinch of sea salt over the middle of each bar and serve. Make Ahead: The shortbread layer can be made up to 4 days in advance and stored in an airtight container. It also freezes well. Storage: These will keep for up to a week in an airtight container in the fridge. Remove 20 minutes before serving, to take off the chill. Recipe excerpted from Sweet: Desserts from London’s Ottolenghi by Yotam Ottolenghi and Helen Goh (Ebury Press). Photography by Peden + Munk.